SANTA CLARA, Calif., June 1, 2017 – Today, Intel Corporation revealed the findings from a new study that explores the yet-to-be-realized economic potential when today’s drivers become idle passengers. 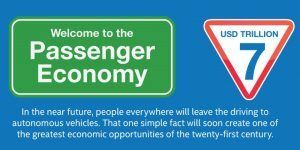 Coined the “Passenger Economy” by Intel and prepared by analyst firm Strategy Analytics, the study predicts an explosive economic trajectory growing from $800 billion in 2035 to $7 trillion by 2050. History has proven that technology is the catalyst for massive societal transformation and that businesses need to adapt or risk failure, or worse, extinction. New digital business models ushered in by personal computing, the internet, ubiquitous connectivity and smartphones gave birth to whole new economies. Autonomous driving will do the same. The research firm further points out that autonomously operated vehicle commercialization will gain steam by 2040 – generating an increasingly large share of the projected value and heralding the emergence of instantaneously personalized services. Business use of Mobility-as-a-Service (MaaS) is expected to generate $3 trillion in revenues, or 43 percent of the total passenger economy. Consumer use of Mobility-as-a-Service offerings is expected to account for $3.7 trillion in revenue, or nearly 55 percent of the total passenger economy. $200 billion of revenue is expected to be generated from rising consumer use of new innovative applications and services that will emerge as pilotless vehicle services expand and evolve. Reductions in public safety costs related to traffic accidents could amount to more than $234 billion over the Passenger Economy era from 2035-2045. Car-venience: From onboard beauty salons to touch-screen tables for remote collaboration, fast-casual dining, remote vending, mobile health care clinics and treatment pods, and even platooning pod hotels, vehicles will become transportation experience pods. Movable movies : Media and content producers will develop custom content formats to match short and long travel times. Location-based advertising : Location-based advertising will become more keenly relevant, and advertisers and agencies will be presented with a new realm of possibilities for presenting content brands and location. The Passenger Economy report was sponsored by Intel and developed by Strategy Analytics. To read the full report and see additional materials, visit the Intel newsroom’s Autonomous Driving Press Kit. Greg Lindsay is an urban mobility futurist and co-author of Aerotropolis: The Way We’ll Live Next. He is senior fellow of the New Cities Foundation, where he leads the Connected Mobility Initiative, and a non-resident senior fellow of the Atlantic Council’s Strategic Foresight Initiative. He is also a visiting scholar at New York University’s Rudin Center for Transportation Policy & Management.